The FrameworkElement class exposes several properties that are used to precisely position child elements. This topic discusses four of the most important properties: HorizontalAlignment, Margin, Padding, and VerticalAlignment. The effects of these properties are important to understand, because they provide the basis for controlling the position of elements in Windows Presentation Foundation (WPF) applications. There are numerous ways to position elements using WPF. However, achieving ideal layout goes beyond simply choosing the right Panel element. Fine control of positioning requires an understanding of the HorizontalAlignment, Margin, Padding, and VerticalAlignment properties. The following illustration shows a layout scenario that utilizes several positioning properties. At first glance, the Button elements in this illustration may appear to be placed randomly. However, their positions are actually precisely controlled by using a combination of margins, alignments, and padding. The following example describes how to create the layout in the preceding illustration. A Border element encapsulates a parent StackPanel, with a Padding value of 15 device independent pixels. This accounts for the narrow LightBlue band that surrounds the child StackPanel. Child elements of the StackPanel are used to illustrate each of the various positioning properties that are detailed in this topic. 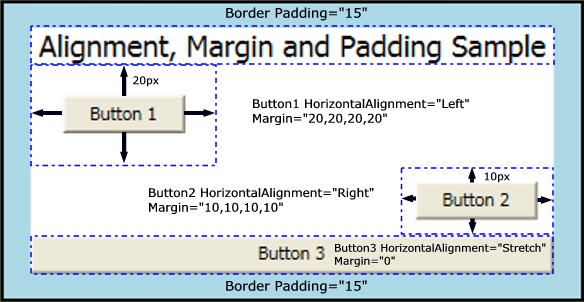 Three Button elements are used to demonstrate both the Margin and HorizontalAlignment properties. // Create the application's main Window. // Add child elements to the parent StackPanel. // Add the StackPanel as the lone Child of the Border. // Add the Border as the Content of the Parent Window Object. 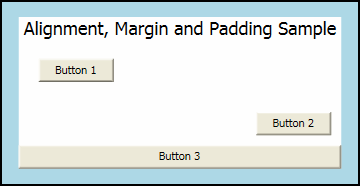 WindowTitle = "Margins, Padding and Alignment Sample"
myTextBlock.Text = "Alignment, Margin and Padding Sample"
'Add the StackPanel as the lone Child of the Border. The following diagram provides a close-up view of the various positioning properties that are used in the preceding sample. Subsequent sections in this topic describe in greater detail how to use each positioning property. The HorizontalAlignment and VerticalAlignment properties describe how a child element should be positioned within a parent element's allocated layout space. By using these properties together, you can position child elements precisely. For example, child elements of a DockPanel can specify four different horizontal alignments: Left, Right, or Center, or to Stretch to fill available space. Similar values are available for vertical positioning. Explicitly-set Height and Width properties on an element take precedence over the Stretch property value. Attempting to set Height, Width, and a HorizontalAlignment value of Stretch results in the Stretch request being ignored. The HorizontalAlignment property declares the horizontal alignment characteristics to apply to child elements. The following table shows each of the possible values of the HorizontalAlignment property. Left Child elements are aligned to the left of the parent element's allocated layout space. Center Child elements are aligned to the center of the parent element's allocated layout space. Right Child elements are aligned to the right of the parent element's allocated layout space. Stretch (Default) Child elements are stretched to fill the parent element's allocated layout space. Explicit Width and Height values take precedence. 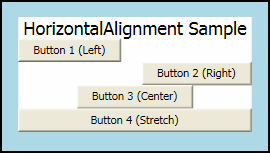 The following example shows how to apply the HorizontalAlignment property to Button elements. Each attribute value is shown, to better illustrate the various rendering behaviors. myButton4.Content = "Button 4 (Stretch)"
The preceding code yields a layout similar to the following image. The positioning effects of each HorizontalAlignment value are visible in the illustration. The VerticalAlignment property describes the vertical alignment characteristics to apply to child elements. The following table shows each of the possible values for the VerticalAlignment property. Top Child elements are aligned to the top of the parent element's allocated layout space. Bottom Child elements are aligned to the bottom of the parent element's allocated layout space. 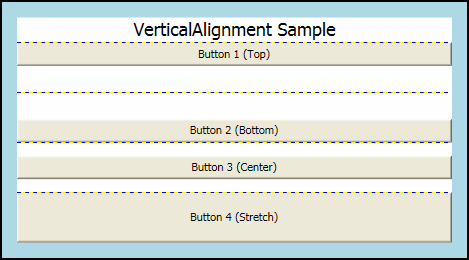 The following example shows how to apply the VerticalAlignment property to Button elements. Each attribute value is shown, to better illustrate the various rendering behaviors. For purposes of this sample, a Grid element with visible gridlines is used as the parent, to better illustrate the layout behavior of each property value. myButton1.Content = "Button 1 (Top)"
myButton2.Content = "Button 2 (Bottom)"
myButton3.Content = "Button 3 (Center)"
The preceding code yields a layout similar to the following image. The positioning effects of each VerticalAlignment value are visible in the illustration. The Margin property describes the distance between an element and its child or peers. Margin values can be uniform, by using syntax like Margin="20". With this syntax, a uniform Margin of 20 device independent pixels would be applied to the element. Margin values can also take the form of four distinct values, each value describing a distinct margin to apply to the left, top, right, and bottom (in that order), like Margin="0,10,5,25". Proper use of the Margin property enables very fine control of an element's rendering position and the rendering position of its neighbor elements and children. A non-zero margin applies space outside the element's ActualWidth and ActualHeight. The following example shows how to apply uniform margins around a group of Button elements. The Button elements are spaced evenly with a ten-pixel margin buffer in each direction. In many instances, a uniform margin is not appropriate. In these cases, non-uniform spacing can be applied. The following example shows how to apply non-uniform margin spacing to child elements. Margins are described in this order: left, top, right, bottom. Padding is similar to Margin in most respects. The Padding property is exposed on only on a few classes, primarily as a convenience: Block, Border, Control, and TextBlock are samples of classes that expose a Padding property. The Padding property enlarges the effective size of a child element by the specified Thickness value. The following example shows how to apply Padding to a parent Border element. HorizontalAlignment, Margin, Padding, and VerticalAlignment provide the positioning control necessary to create a complex user interface (UI). You can use the effects of each property to change child-element positioning, enabling flexibility in creating dynamic applications and user experiences. The following example demonstrates each of the concepts that are detailed in this topic. Building on the infrastructure found in the first sample in this topic, this example adds a Grid element as a child of the Border in the first sample. Padding is applied to the parent Border element. The Grid is used to partition space between three child StackPanel elements. Button elements are again used to show the various effects of Margin and HorizontalAlignment. TextBlock elements are added to each ColumnDefinition to better define the various properties applied to the Button elements in each column. // Add the ColumnDefinitions to the Grid. // Add the first child StackPanel. // Add the second child StackPanel. // Add the final child StackPanel. // Add child content to the parent Grid. // Add the Grid as the lone child of the Border. // Add the Border to the Window as Content and show the Window. 'Add the first child StackPanel. myTextBlock2.Text = "ColumnDefinition.Width = ""Auto"""
myTextBlock3.Text = "StackPanel.HorizontalAlignment = ""Left"""
myTextBlock4.Text = "StackPanel.VerticalAlignment = ""Top"""
myTextBlock5.Text = "StackPanel.Orientation = ""Vertical"""
myTextBlock6.Text = "Button.Margin = ""1,10,0,10"""
'Add the second child StackPanel. myTextBlock8.Text = "ColumnDefinition.Width = ""*"""
myTextBlock9.Text = "StackPanel.HorizontalAlignment = ""Stretch"""
myTextBlock10.Text = "StackPanel.VerticalAlignment = ""Top"""
myTextBlock11.Text = "StackPanel.Orientation = ""Horizontal"""
myTextBlock12.Text = "Button.Margin = ""10,0,10,0"""
'Add the final child StackPanel. myTextBlock14.Text = "ColumnDefinition.Width = ""Auto"""
myTextBlock15.Text = "StackPanel.HorizontalAlignment = ""Left"""
myTextBlock16.Text = "StackPanel.VerticalAlignment = ""Top"""
myTextBlock17.Text = "StackPanel.Orientation = ""Vertical"""
myTextBlock18.Text = "Button.Margin = ""10"""
'Add child content to the parent Grid. 'Add the Grid as the lone child of the Border. When compiled, the preceding application yields a UI that looks like the following illustration. The effects of the various property values are evident in the spacing between elements, and significant property values for elements in each column are shown within TextBlock elements. Positioning properties defined by the FrameworkElement class enable fine control of element placement within WPF applications. You now have several techniques you can use to better position elements using WPF. Additional resources are available that explain WPF layout in greater detail. The Panels Overview topic contains more detail about the various Panel elements. The topic Walkthrough: My first WPF desktop application introduces advanced techniques that use layout elements to position components and bind their actions to data sources.